My post last week about the importance of core training to our fitness drew a lot of traffic and great feedback. 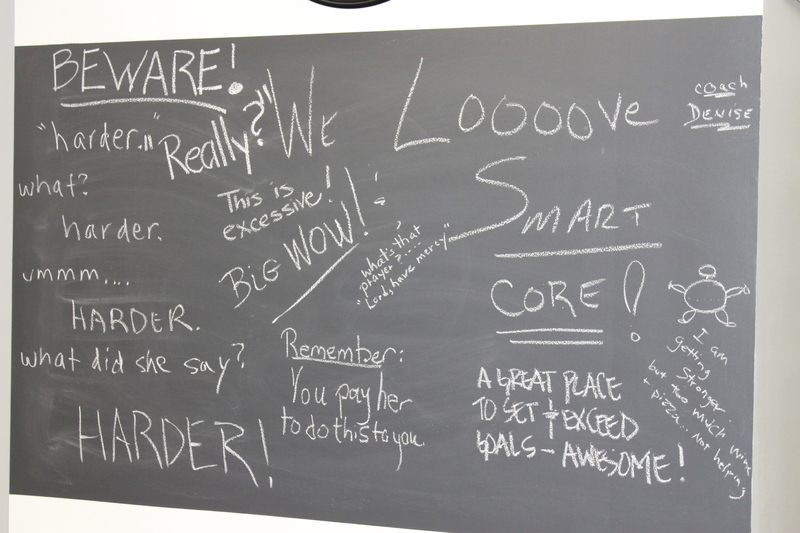 I gave readers a brief introduction to SmartCore Fitness, which recently opened its permanent location in the Midtown area of Charlotte. 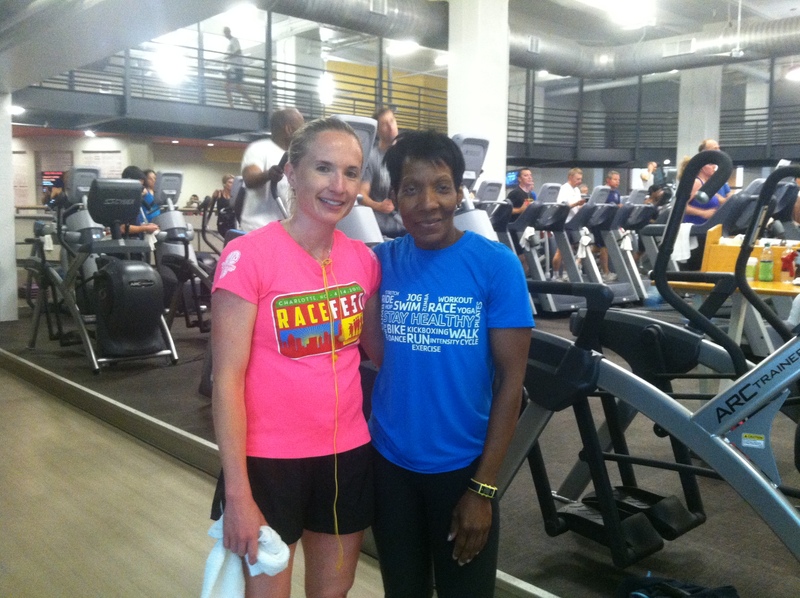 This week, I joined a small training group to complete my first workout with owner/personal trainer Denise Duffy. This studio and endeavor has been a long time coming for Denise. I first met Denise in 2007 upon taking one of her coveted cycle classes at the Dowd YMCA. My husband was also teaching at the Y at the time, so their friendship allowed me to get to know her better over the years. It was through several interactions that I learned Denise is a Duke graduate who left a corporate career at GE to enter the fitness industry. 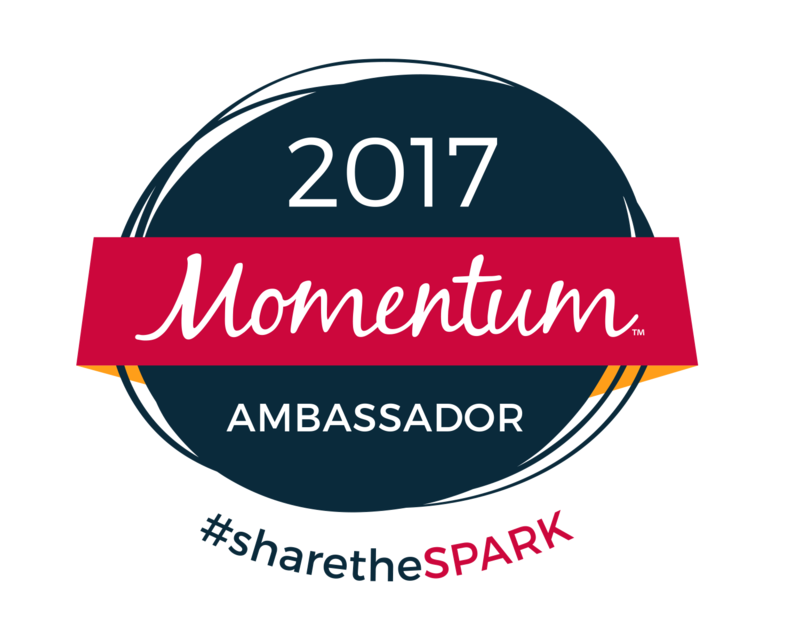 Her passion helped her build an incredible group of clients. Through her hands on approach with each client, Denise is able to adjust group training circuits, to meet the needs of individuals. 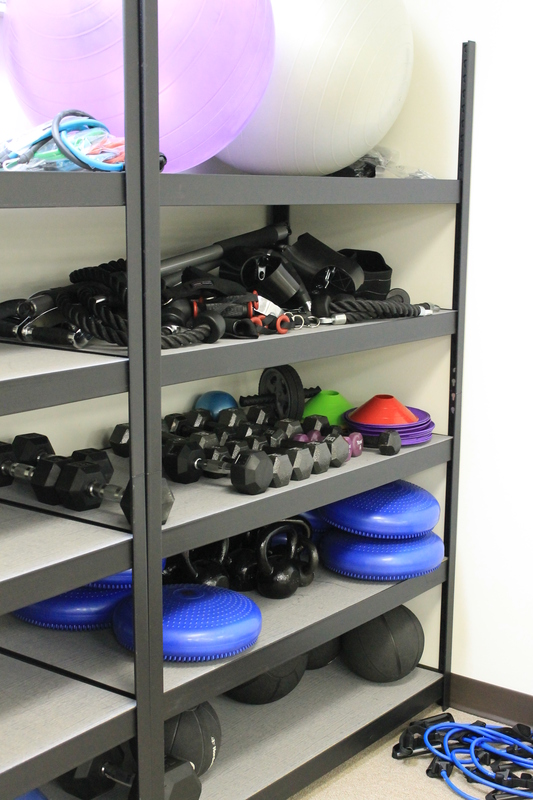 In fact, to better meet the needs of her clients, she took the step towards opening a studio that was better equipped to handle the type of workouts that her groups are used to. So, that brings me to SmartCore Fitness and my workout. The location (situated on Baxter Street between Uptown and Myers Park) is great and so are the hours. The first training group starts at 5:30 AM and there are sessions all the way through lunch. Parking is free and getting in and out of the lot is very easy. Let’s talk about the inside. I can describe this place in three words: open, clean, and upbeat. 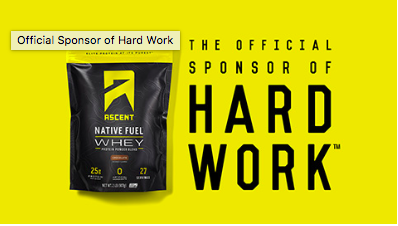 Everything you need from the place that you are going to work out. 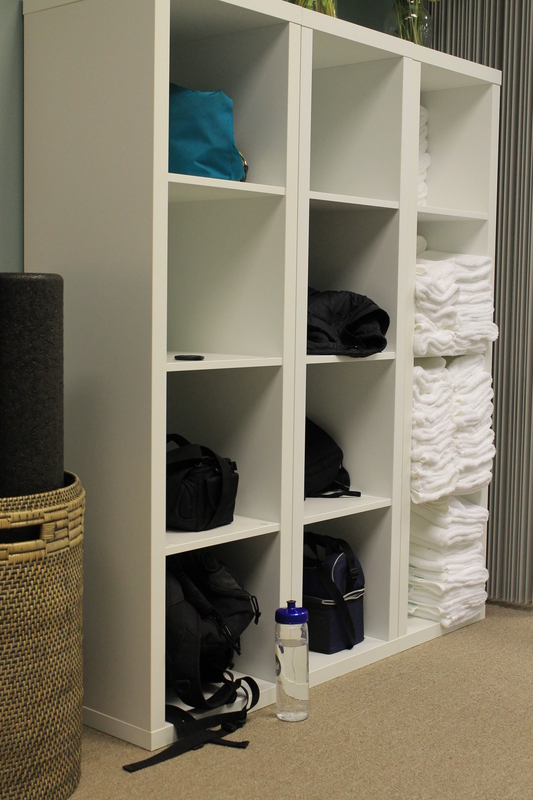 Upon entering the studio, there is a room with cubbies (see above) for clients to put their things in. In the case that you need to change, there is a beautiful single person bathroom. The studio is set up such that two groups can be running the same circuit simultaneously beside each other. Each group is made up of 2-6 people. This is not one on one personal training, but rather station to station group training. I will be the first to say that these stations are more intense and well thought out than anything I have ever done. Remember in my prior post when I said the core is made up of a lot more muscles than just the abs (some of them you probably don’t even know that you use)? Denise has found a way to touch all of those muscles in a planned format that will allow your body to get the most out of each exercise. I can’t list everything we did today, because it took me over an hour to complete and the moves are very complex. Exactly why you need to stop by (you get your money’s worth). 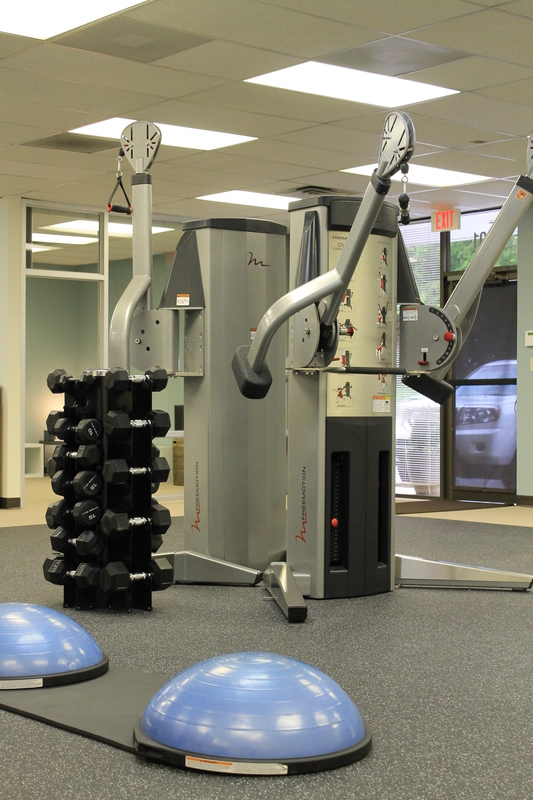 It is worth mentioning that the facility has four FreeMotion Dual Cable Cross machines. I bring this up because these machines by themselves have gotten a lot of great publicity lately as it relates to core/strength training. Both Shape and Self Magazine recently had great write-ups and workouts on the machines (see links below). With the ability to run two circuits at the same time, Denise opted to bring a second personal trainer into the business. That is where Steve Justice comes in. What a perfect fit. Steve is also currently an instructor at Flywheel, but his background in athletics and fitness goes far beyond Flywheel. Steve was an All-American Center while playing football at Wake Forest. He also played in the NFL several years, which ultimately brought his family to Charlotte (he played for the Panthers). After he stopped playing football, he lost over 100 pounds and he has completely transformed his exterior physique. Like Denise, he is very down to earth and light hearted (as seen through the sweet picture above with his beautiful little girls). And in case you were wondering, Denise would not have brought Steve on if he couldn’t provide the same individual/unique experience to each client that she does. The circuits will be the same regardless of whether Denise or Steve are working you through them. So, how do you get hooked up with this great group? 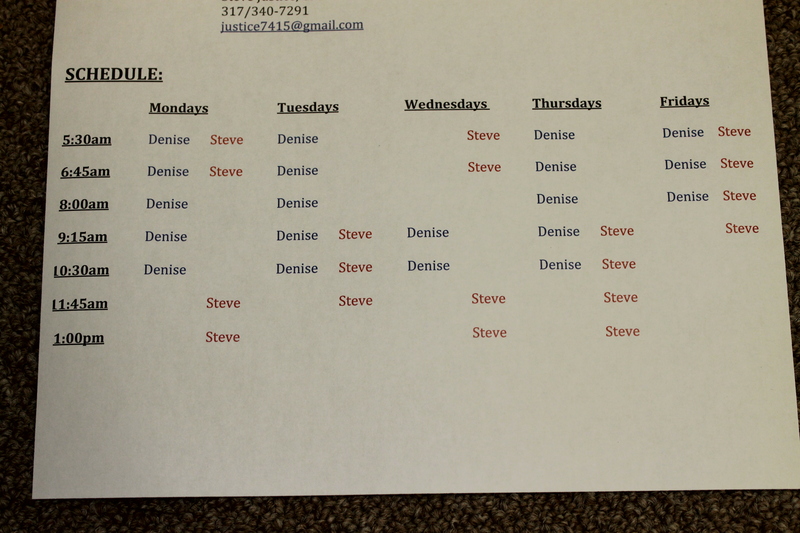 Denise and Steve both still have space open to train new clients. See the scheduled times for both below. The best way for you to reach them is through email or phone. Please feel free to ask many any other questions as well. I loved my first visit. The group that I worked out with was so fun and encouraging. As I write this, I am still feeling the effects of a workout that made me feel empowered and strong. This entry was posted in Staying fit, workout and tagged charlotte, core, Denise Duffy, fitness, FreeMotion, SmartCore, Steve Justice on April 30, 2014 by flyjenduf. Ugh Monday. We are going through that phase with baby where she is reverting back to waking up some in the middle of the night. Sometimes she needs food, sometimes she needs her diaper changed, and sometimes she just wants to let us know that she is awake. Who knows, she might even be teething. To get through this little patch, we have started taking turns each night based on who is going to the gym in the morning (For example, if I have to teach in the morning, my husband gets up in the middle of the night and vice versa). It might sound crazy, but this is the type of stuff you have to do to maintain your normal life. Typically, I would have a picture of my equipment used in the workout! There is none! As I have mentioned before, I include “travel day” in parentheses to my Monday workout, because I like to think that my typical Monday workout is something that could be done on a day that you might be on the road or in a time crunch. After my rough night, I opted to sleep in later this morning, which left me with about thirty minutes to squeeze some strength in. 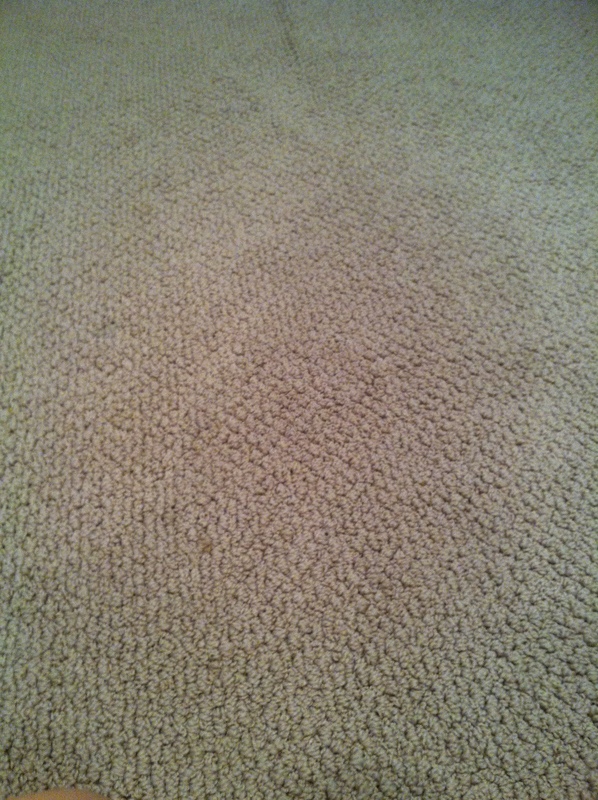 If you notice in the picture above there is no equipment. Yes! You can totally do this in your hotel room or at your house (and believe me it will get your heart rate up). Workout came in a tad under thirty minutes. The meat of the workout is sort of monotonous, BUT it is effective. Check it out. 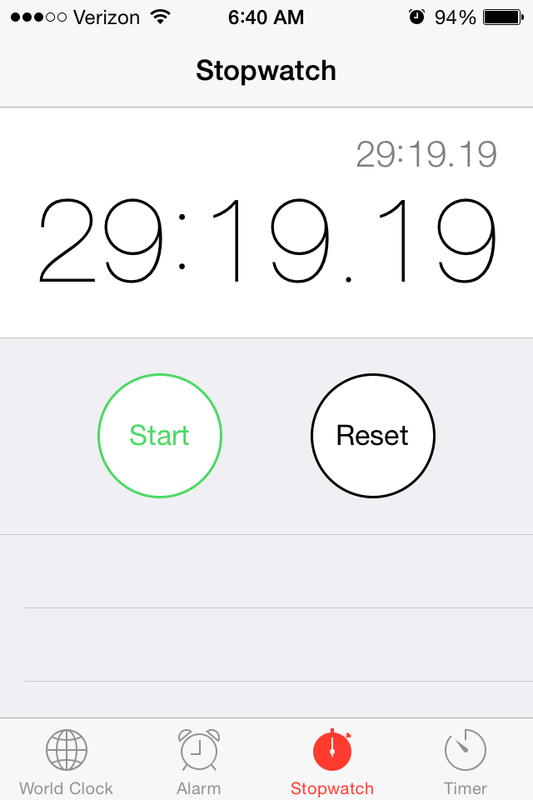 Warm up – As always, I start my stopwatch when I start my warm up. 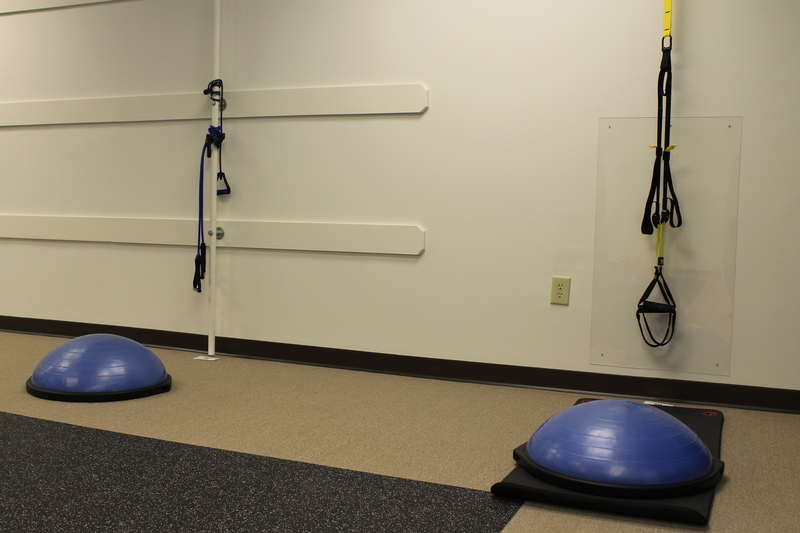 Today, I began by walking in place, slowly increasing the range of motion in my knee drive and arm movement. I went straight into some imperial walkers, side to side step touches and some deep body weight squats (arms extended to ceiling). I did have a long weekend of Flywheel classes, so I took a second to stretch out my quads and hamstrings through static stretches before starting. 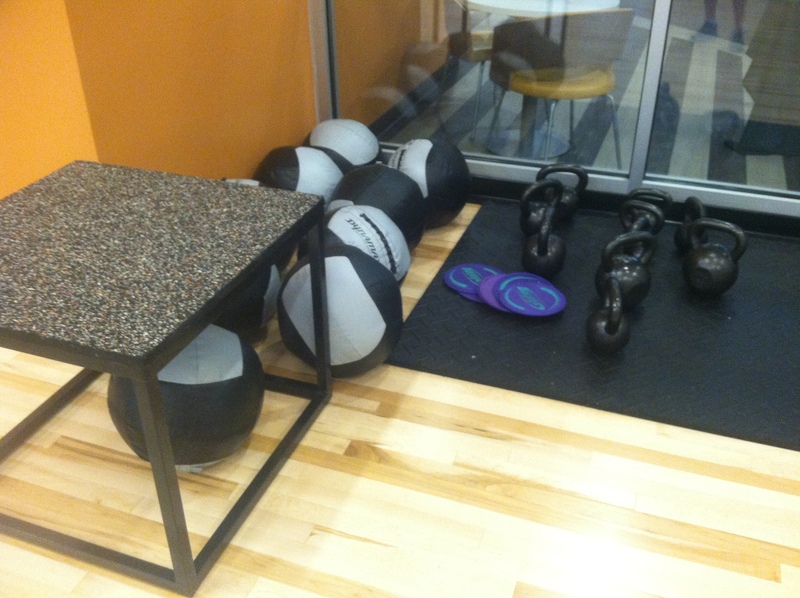 Burpee/Squat Combo – Yes, a spinoff of my burpee/kettle bell swing combo. Start by doing ten body weight squats. From there, do ten burpees. Work your way down the set until you get to 1 (so, your next set would be 9 squats, 9 burpees, etc.) The burpee part gets your heart rate up quick, so if this is your first time doing this, stick with 10. As you get better, you can start as high as 15-20. Modification – If you have a kettle bell, you can do the kettle bell swings instead to boost your heart rate even more. If you start to fatigue on your burpees, lose the explosiveness (step one foot back at a time, do a pushup, step one foot back to staringt position at a time). At this point, I was close to 18-20 minutes. I really wanted to hit my glutes today, so I opted to do the following exercises in sequential order three times through. Leg Whips – I accidentally ran into these exercises when scrolling through my Women’s Health Facebook news feed. Start in a hip bridge with hands extended to your sides. Your hips are raised off the ground, so that your body forms a straight line. Extend your right leg straight in the air, while keeping your left leg bent, foot on the floor. While keeping right leg straight in the hip bridge, lower the right leg as far as you can to the side without letting your hips move. All about control. Do 10 each side. Sprinter Sit ups – I wanted to do a core exercise here that didn’t utilize equipment. Start laying flat on your back, legs straight, and arms by your side with your elbows bent at 90 degrees. In a powerful quick motion, sit up, twist your upper body to the right and bring your right knee toward your left elbow. That’s 1. Do 20 each side. Think quick and powerful. Who knew that you could get out of breath doing sit ups? Clam Digs – Lie on your right side, head cradled in your right hand. Bend your knees in front of you at a 45 degree angle. Lift your left leg up to the ceiling. Left leg should be a a 90 angle (keeping hips stacked without rocking backwards). Do 10 each side. Side Balance Crunch – Balance yourself so that your right hand is on the floor, arm is straight, and your right leg is extended straight (with foot on floor). Hips should be raised such that your body forms a straight line from your shoulders to your feet. In this position, pull your left knee toward your torso and left elbow toward your knee. Straighten arm and leg. Repeat on opposite side. Do 10 each side. I saw this awesome tip on twitter this weekend – “It’s not the length of your workout but the intensity. If you do the right things a 45 minute workout can be better than three hours at the gym”. Amen. The workout above was far more intense than anything that I used to do at the gym on a machine. Be effective! We continued our weekend of food, friends, family and Flywheel Sunday. 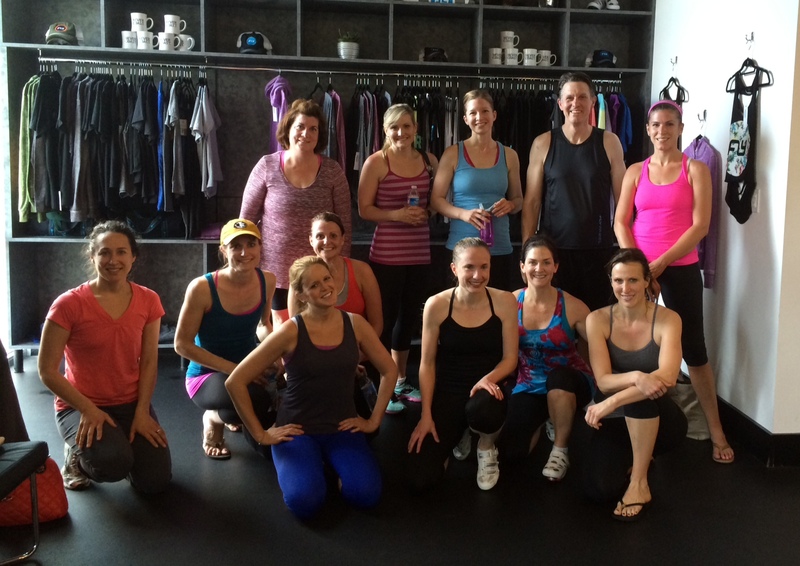 After an awesome Flywheel block party on Saturday evening, I was surprised to see some of my neighbors that were at the party in my Sunday 7:30 AM class. Love it! Through talking to many riders outside of the studio, I realized that the Charlotte studio is full of some very intense athletes that always want more. Well, if you ask, you shall receive. Sunday’s opening ride was TOUGH. Strong climbs, fast sprints. This group owned it. By the way, if you didn’t notice there is a ton of awesome gear for sale in the studio. 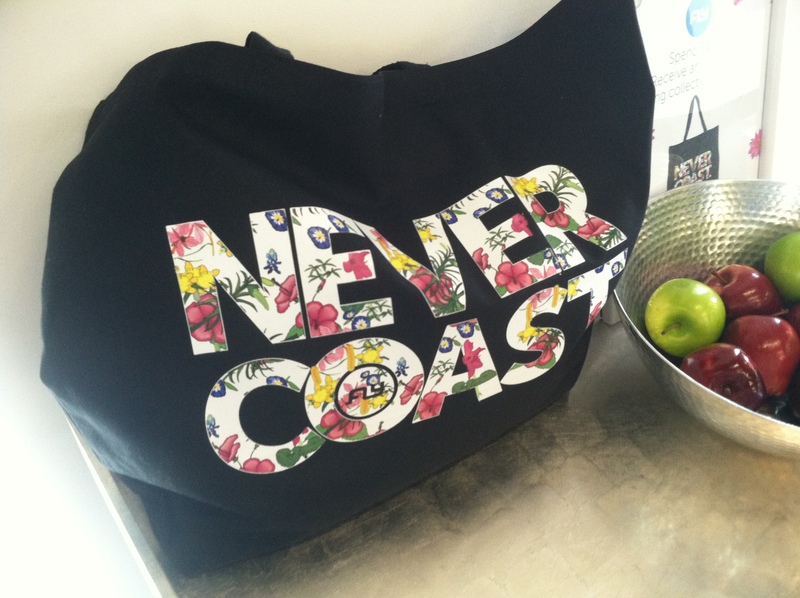 If you happen to spend $100, you get the beautiful floral print bag shown above. Post ride, we grabbed brunch at another local breakfast spot. 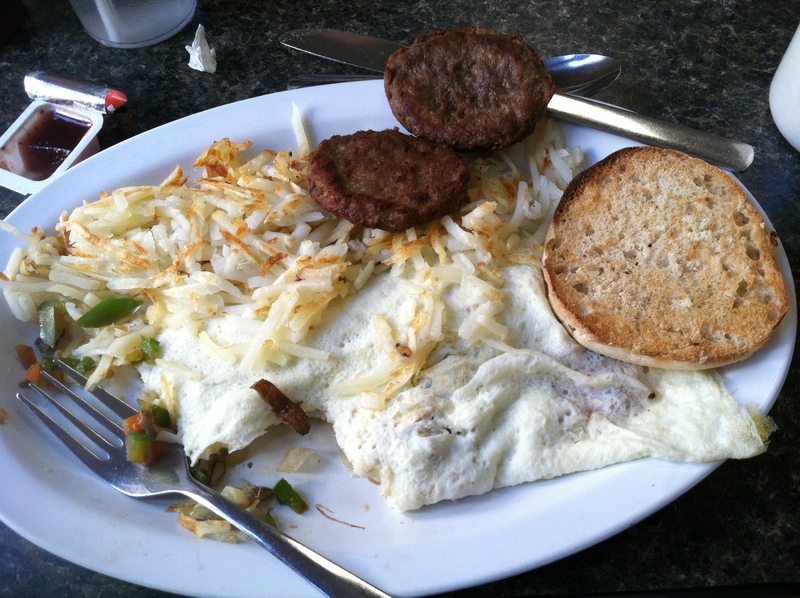 After several rides in a 24 hour period, my breakfast was not the healthiest, but I did try to sub some things to make it better (egg whites instead of eggs, no cheese but veggies in my omelet, turkey sausage instead of pork). It’s the little things that do make a difference. The rest of the afternoon was Grandpa Dufresne time. 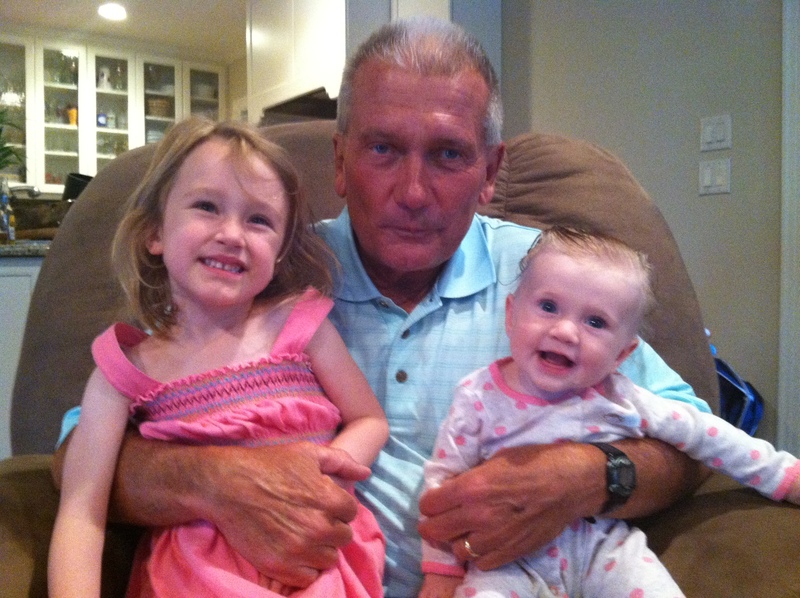 His granddaughters love him as much as they love each other. Sunday dinner was family time. Too much food, but it will come in handy when I attempt to make some baby food this week! It should be interesting. I will keep you posted. 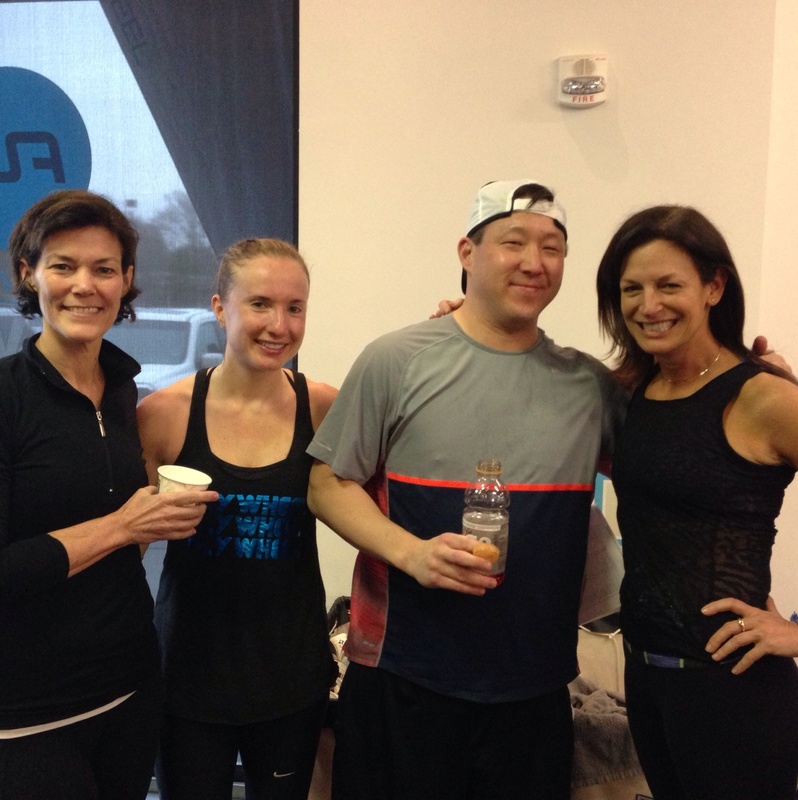 This entry was posted in food, Staying fit, workout and tagged brunch, charlotte, circuit training, flywheel, Sunday on April 28, 2014 by flyjenduf. 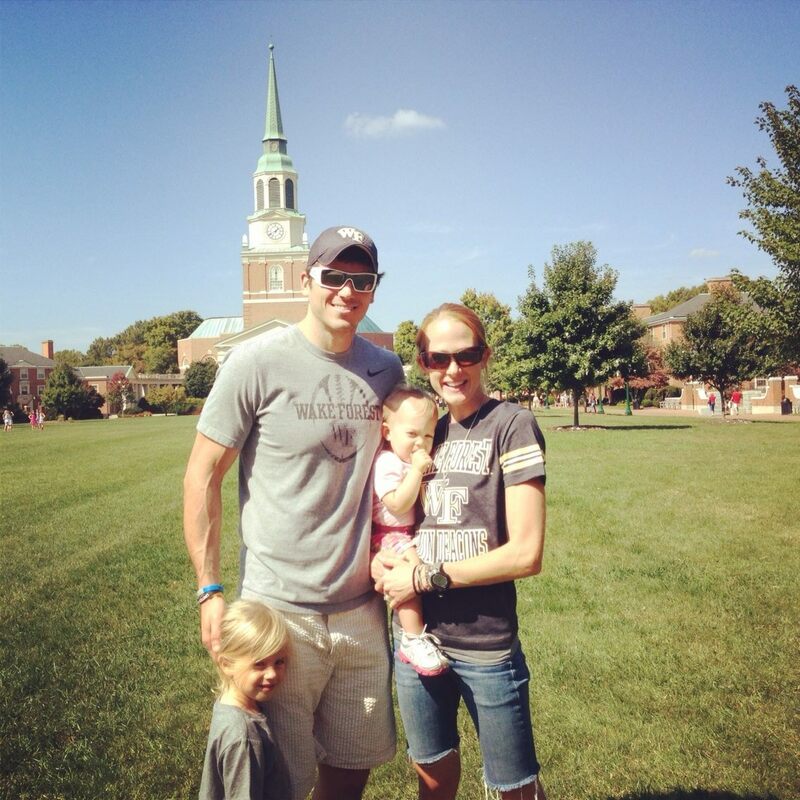 What a beautiful weekend in Charlotte! My father-in-law/Grandpa Dufresne is staying at our house for several days. 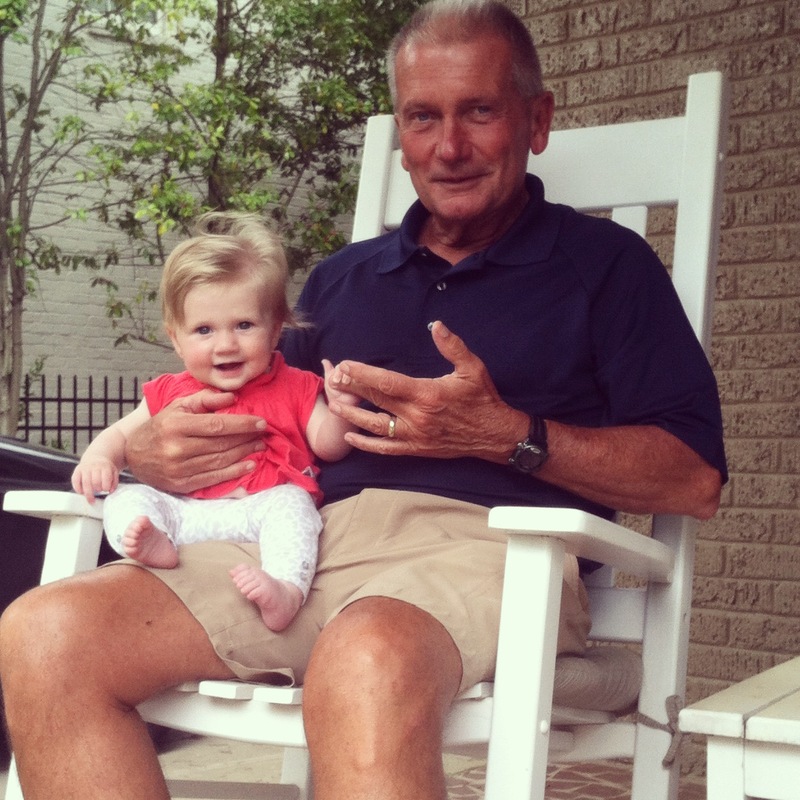 The last time that he saw his granddaughter was when she was just 10 days old. Needless to say, she has grown up ALOT since then. I am so happy that they get some quality time together over the next several days (with this weather, I think that they will be spending a lot of time sitting in the rockers on the front porch). 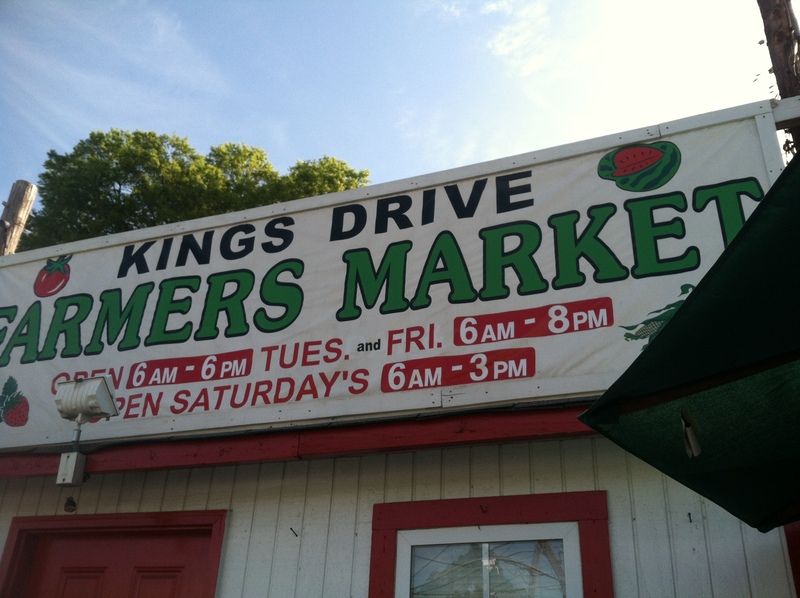 With Grandpa Dufresne in town, that gave me some time to pick up some things at the farmers market Saturday morning. I was not the only one! It was packed as early as 9AM. I cannot reiterate enough how much more fresh and cheaper the food is at your farmers market compared to the grocery store. Not to mention, it just feels better shopping for this type of food in its element – outdoors. I get a lot of stuff at the farmers market, but I would say there are two things that I buy almost weekly that are unbelievably cheaper than the grocery store – watermelon and raspberries. 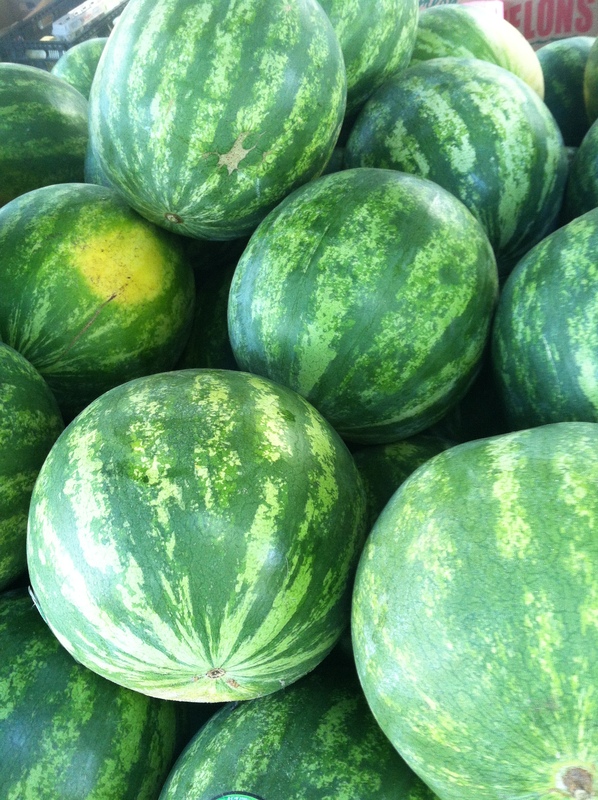 Seedless, whole watermelon (and I’m talking HUGE) $5.99. Organic raspberries, only $2.99 (I have seen non-organic raspberries at the grocery store at upwards of $5.99 a piece!) It is hard to force yourself to make an extra trip somewhere just to get fruit and vegetables, but most farmers markets are in pretty central locations (like the one that we go to). You really don’t know what you are missing until you check one out. So, I have hit food and family, now it is time to talk about how friends and Flywheel fit into my weekend. We are fortunate enough to live on a street in which homeowners have a great sense of camaraderie. There are also close to thirty kids between the ages of a few months old to teenagers. We typically have a block party on our street for Halloween, but this year we decided to have a spring kickoff block party with a pre-Flywheel ride. What? Yes, Flywheel before the block party! 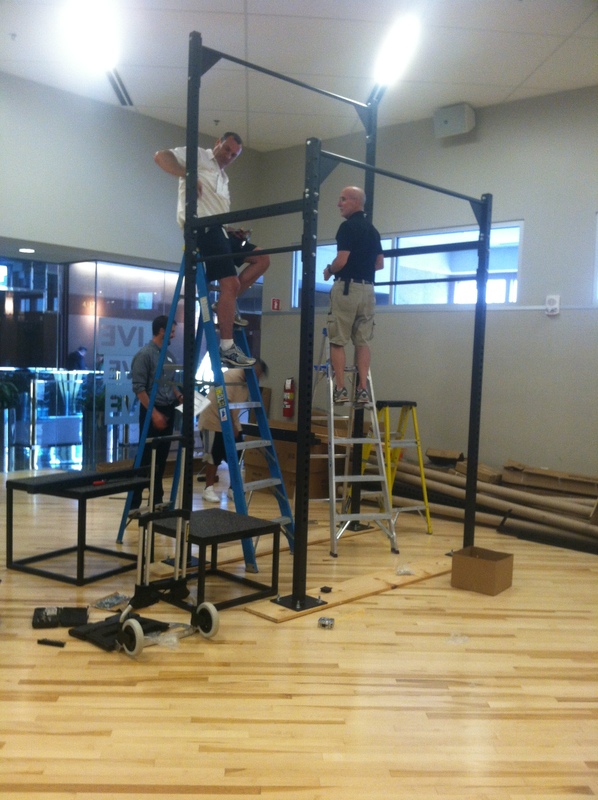 One amazing thing about Flywheel is that the studio will host “private” rides with your favorite instructor. Think pre-wedding, sorority, class reunion, anything! Just ask. They even do this for FlyBarre. After a good sweat, we all headed home to get changed before the block party. Through a very easy process, the City of Charlotte will allow neighbors to close down a section of the street to make it easier for kids and parents to navigate while a party is going on. 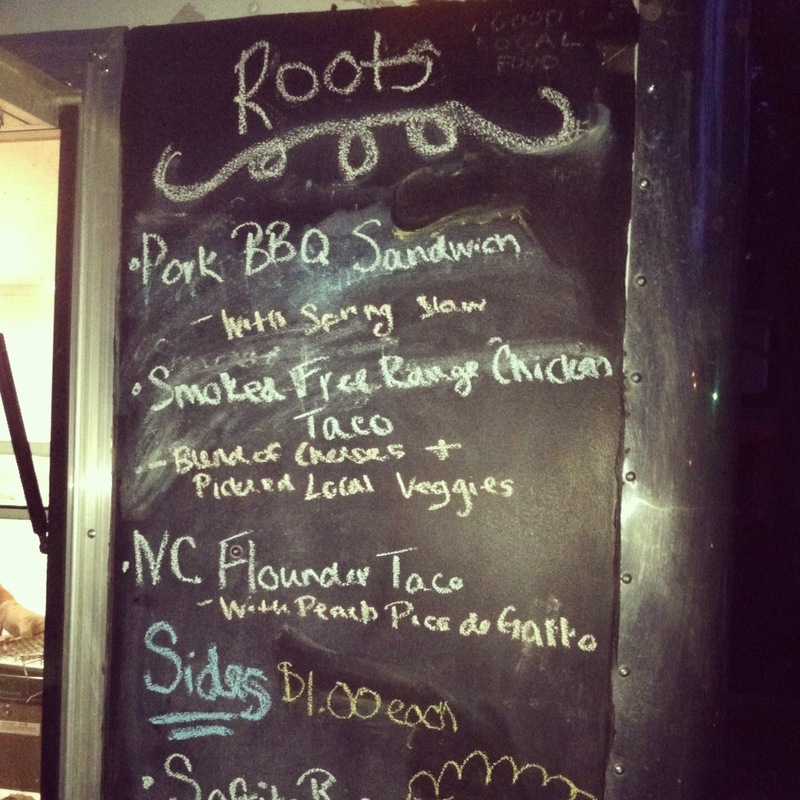 Lucky for us, we were also able to secure Roots Farm Food food truck to provide our meals for the evening. If you haven’t heard of Roots Farm Food, the chefs use all fresh, locally prepared ingredients. 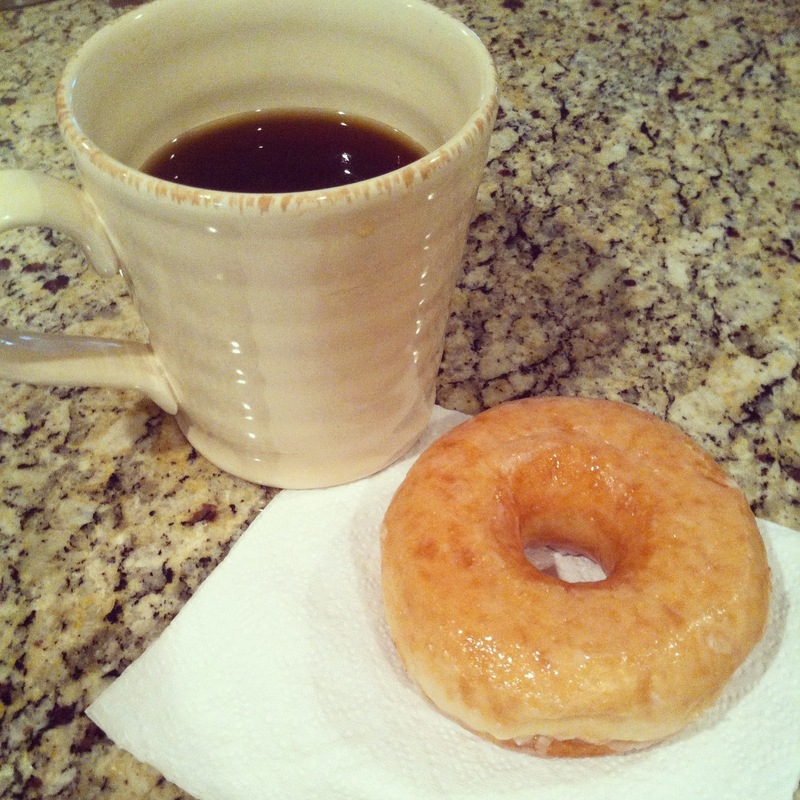 Everything is reasonably priced and delicious. 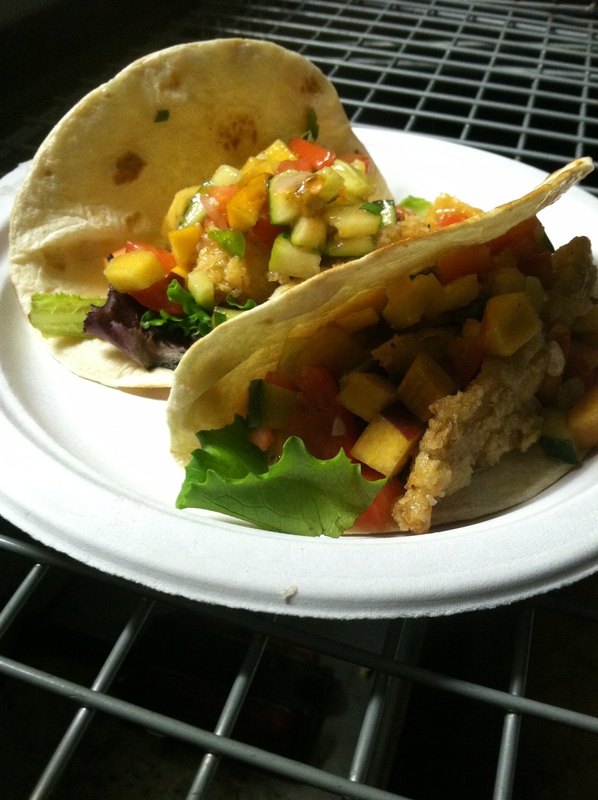 I had the North Carolina flounder tacos with peach pico de gallo and rice. Delicious, and right at $10. With the food truck operating on a closed street, it took the pressure off of neighbors to cook. It also allowed kids to roam free without worrying about traffic. Nothing better than working out with your neighbors and then enjoying a cold drink and good, local food. This entry was posted in food, Staying fit, Uncategorized, workout and tagged FlyBarre, flywheel, food truck, raspberries, Roots Farm Food, Simpson's Farmers Market, watermelon on April 27, 2014 by flyjenduf.